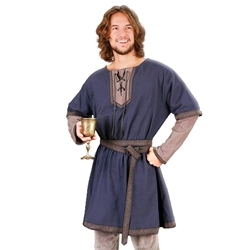 From the age of William the Conqueror comes this courtly Norman Saxon tunic. Manufactured of sturdy homespun blue and grey cotton twill, this tunic is designed to give the look of layered garments with the comfort of a single shirt. The lace-up neckline has a hidden snap, allowing for a tight-looking collar line. Matching period trim and a double-wrap belt is included. It would be very helpful if this had a size chart, with the exact measurements.